The new publication, “Krsna-krida, The Art of Engaging Children’s Playful Attitude” humbly attempts to fulfill this instruction and thus serve the Vaisnavas. This hardbound print brimming with around 65 illustrations is sure to enthrall the children and adults equally. EPub edition is available too. The process of Bhakti-yoga is joyful, more so for children. The Supreme Personality of Godhead, Sri Kṛṣṇa is known as bāla-krīḍā-samāsakta, meaning that the Supreme Lord is attached to enjoying the playful pastimes with his childhood friends. In fact, in the spiritual world, Goloka Vrindavana, these childhood pastimes are eternally going on. When the Supreme Lord incarnated in this material world, His childhood pastimes are considered to be the most glorious and rare. Sripad Bhakti Raghava SwamiWe should all be most thankful to the author for giving us such an extensive and elaborate presentation of this dimension of children’s early education. The book is very authoritative being filled with supportive statements and references. This book is a must for both parents and educators.Sripad Lokanath SwamiThe essence of the text is reminiscent of the village life where I was born. In the village of Aravade, play was free and fearless around countryside cows. As children, we frolicked on expansive hills and sprawling valleys and played hide and seek in rows of endless sugarcane plantations. The perspectives on “play” as demonstrated by Krsna and his friends and captured in Krsna-Krida provide a historical and modern understanding of how children should play to develop an intense attachment to Krsna. Bharat Chandra Dasa vividly captures the exuberance of play and the laughter of Krsna during play. The advice that is offered is direct and echoes Srila Prabhupada’s insights on how to bring up children. The research work is incisive and the work of respected Vaisnava acaryas are used to underpin suggestions made. Srila Prabhupada said that we should encourage children to play Krsna games and in this way develop a love for Krsna. Several dimensions of parenting styles are illustrated and the art of engaging children’s playful attitude can be considered the ultimate handbook for parents in rearing their children. The display of this art by the cowherd friends of Krsna in Gokula and Vrndavana offers a range of issues that permeate the understanding of how children play. This book is a fundamental contribution to progressive parenting ideas drawn from spiritual literature – it is a manual as to how parents can be present in the lives of their children and nurture them in Krishna consciousness through the sacred art of play. Sripad Bhakti Vikasa SwamiChildren naturally love to play, reflecting the playfulness of Kṛṣṇa in his boyhood. Although such playing can be simply a waste of time in the valuable human form of life (as Srila Bhaktivinoda Ṭhakura sings, khela-rase saisava; see also SB 7.6.7), children who learn to play according to the directions of this book can, from the beginning of life, become attached to Kṛṣṇa and thus make a good start on the great journey back to Godhead.I congratulate Bharat Chandra Dasa for bringing out another in his series of practical varṇasrama guides, and I pray that the Supreme Lord Sri Kṛṣṇa bless him with long life, good health, and fixed focus so that he may produce many more such invaluable books. Sripad Bhakti Rasamṛta Swami“Kṛṣṇa-kriḍa” is impressively & meticulously researched, provides sublime insights into how children can joyfully participate in the devotional process and it is also an enchanting read for grown-ups. This book is a useful & practical contribution to the glorious attempt to revive Kṛṣṇa conscious culture in the modern world. Sri Gadadhara Paṇḍita Dasa (Author of several Viasnava literatures in Russian language)Indeed the intrinsic nature of every individual soul – we find happiness in performing casual pastimes. However while doing so as inbounded beings in the Material world we are regularly forced to become – maya-kriḍanaka – a puppet toy in the hands of deluding energy Maya. However if according to instructions of saints, carefully presented by the author in this compilation, along with our dear children we will learn the art of playing as team members of Sri Kṛṣṇa, that will definitely invoke in our lives God’s lila-sakti – His divine energy of playful spiritual existence.Dr. Demian Martins (Author, Samskrt scholar and Research head at Baladeva Vidyabhusana Manuscript project)The modern way of life is quickly overshadowing ancient traditions based on Vedic wisdom, which are ultimately meant to lead everyone to God realization. ‘Kṛṣṇa-kriḍa’ is a brilliant and well researched presentation of an important aspect of this culture and its approach to impart Vaisṇava values to children of all age groups. The author deserves kudos for being a pioneer in bringing out this topic in English for the benefit of parents, teachers and children all over the world. Srimati Aruddha Devi Dasi (Author of “Homeschooling Krsna’s Children”)Bharat Chandra Das’s book, Kṛṣṇa-kriḍa, gives great encouragement and faith to parents and educators that just by engaging our children in playing for Kṛṣṇa and hearing about Kṛṣṇa, we can help them develop pure love of God. This book is based on sastric evidence and many examples from the lives of our acaryas, who exhibited symptoms of bhakti in their childhood play. We, parents and teachers, can also give our children an environment steeped in Kṛṣṇa consciousness by facilitating their Kṛṣṇa-centered play. This book is a definitive guide to Kṛṣṇa conscious activities for children, and I encourage all to read and assimilate. Sri Lila Govinda Dasa (B.Tech from IIT Kharagpur, Teacher at Bhaktivedanta International School, Vrindavan)It is always important to set some written objectives as guidelines for training the children, be it inside or outside the classroom. Not setting any objectives would naturally degrade the quality of the training. Śrila Prabhupada said, “Teach the small children to play Kṛṣṇa games. By keeping them always diversified they shall not lose interest and will keep their attention always focused around Kṛṣṇa.” However, to bring ‘diversity’ and ‘attention’ is a challenge for a teacher or parent, especially, outside the classroom while keeping their attention always focused around Kṛṣṇa. 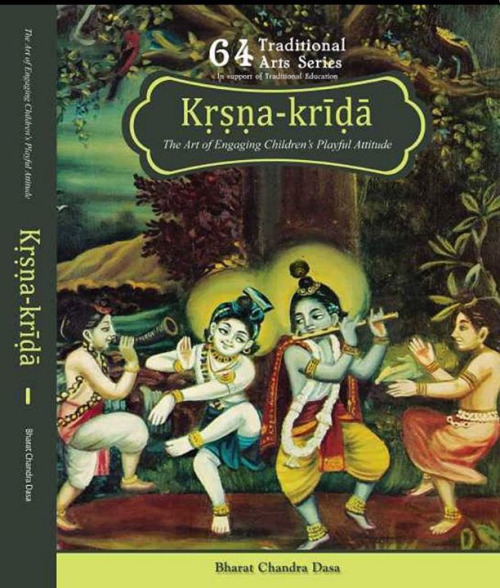 ‘Kṛṣṇa-kriḍa’ is an amazing compilation with detailed and constructive guiding principles in engaging the children. Proper implementation of games suggested in ‘Kṛṣṇa-kriḍa’ can give children, parents and teachers transcendental experiences focused around Kṛṣṇa. A must resource for all the teachers, parents, educators, Sunday school gatherings, libraries and everyone who is dealing with children.